The greatest venues and festivals everywhere have welcomed him, from the National Opera in Paris and the Metropolitan Opera in New York to London's Royal Opera House, the Chorégies in Orange, Berlin's Deutsche Oper and La Scala in Milan. In Roberto Alagna's 30-year career he has added over sixty roles to his repertoire, from Alfredo, Manrico and Nemorino to Calaf, Radamès, Otello, Rodolfo, Don José, Mario and Werther… all in performances which have made Alagna the most famous French tenor in the world. His taste for exploration has shown his love for less-common works, via productions, concerts and recordings of Massenet's Le jongleur de Notre-Dame or La Navarraise, Lalo's Fiesque, Alfano's Cyrano de Bergerac, Zandonaï's Francesca da Rimini or Puccini's Gianni Schicchi... Even two contemporary operas have been composed especially for him, Vladimir Cosma's Marius et Fanny, after Marcel Pagnol, and Le dernier jour d'un condamné, after Victor Hugo, which was composed by David Alagna with a libretto by Roberto and Frédérico Alagna, and staged for the first time in France in Avignon, in 2014. His prolific discography also testifies to the eclecticism of Roberto Alagna's career; bearing the indelible imprint of his passion for song, his recordings clearly illustrate his desire to break with convention. Beyond the frontiers of Opera, he has also successfully ventured into the world of traditional song, a crossover between genres which, as a complete vocal artist, Alagna has accomplished with the same commitment, generosity and sincerity, the same exacting rigor and technique, the same talent. And he has done so without the one ever detracting from the other. On the contrary, each continues to serve the other. It shows his fertile musical eclecticism, something which has always been close to the tenor's heart, ever since his debuts, but this trait became a concrete reality with the album in tribute to Luis Mariano which he recorded in 2005, the year which marked his signature with Deutsche Grammophon. His subsequent triumphs have made Roberto Alagna an authentic popular artist, a personality loved by an ever-increasing public. Seduced by every aspect of song, the tenor has since made regular incursions into popular music in the margins of his increasingly dense opera-schedule. In 2012/2013 for example, he gave some forty performances and recitals, tackling 14 different works including 4 role-creations. In parallel, his Little Italy tour, a spectacular tribute to his origins and to the music-culture of Italy in all its diversity, was a magnificent triumph in over fifteen French cities. In June 2014, Roberto Alagna appeared in Fès (Morocco) at the International Festival of World Sacred Music, creating an event with a brand-new spectacular entitled Mediterraneo. Accompanied by a Middle-Eastern instrumental ensemble, Alagna drew from opera, religious and traditional repertoire lying at the crossroads of Western, Arab-Andalusian, Sicilian and Neapolitan influences. In these stage performances — and the creative work accompanying them — Alagna has found new breathing as well as new resources, and also gained a particular aura, rare in the universe of Opera. Two particular highlights in his career: his moving Marseillaise, which he sang on July 14th 2005 in front of the Presidential Tribune on the Champs-Elysées, and the recital he gave in 2009 in the prestigious setting of the Gardens of the Château de Versailles. In Versailles he drew a crowd of over 8000, a wide audience who came to listen to him sing famous arias from French operas, but also revive some forgotten works in that repertoire, partnered by an orchestra conducted by Michel Plasson. Open to innovation and experiment in the promotion of opera, Roberto Alagna has regularly given himself up to the exacting exercise of "live" television and film broadcasts (in Orange, France, and at New York's Metropolitan Opera). Convinced of the importance of DVD in the future of recorded opera, and of the interest which lies in the decompartmentalization of artistic disciplines, Roberto Alagna, together with his brothers David and Frédérico, has also made a commitment to original productions such as Gluck's Orphée et Eurydice, Alfano's Cyrano de Bergerac, Leoncavallo's Pagliacci or Massenet's Werther... Released early in 2014, the DVD of the latter production remained in the top French Music DVD charts for nine consecutive weeks, all music-genres combined. His genuine love for an immoderate number of roles (and the genius of their composers) has made Alagna's discography as impressive as his insatiable curiosity for opera. With recordings for Erato, Sony, EMI and now Deutsche Grammophon these past ten years, his discography covers a wide range: complete sets, duets, oratorios, operas, anthologies of great works, religious and popular songs… They are as many landmarks which testify, both vocally and artistically, to the journey made since his debuts when, at the age of seventeen, singing in Parisian cabarets, he met the Cuban bassist and singer Rafaël Ruiz. Ruiz was to become his first singing-teacher. A few years later, in 1988, Alagna placed first in the Pavarotti Competition in Philadelphia, which gave decisive impetus to a career which he has continued to lead with constantly renewed rhythm, vitality and freshness. Following a noticed and particularly committed debut as Otello (last summer in Orange, on the legendary stage of the Roman Amphitheater), primarily motivated by his passion for voice, and still instinctively exploring new territories, Roberto Alagna approaches his many projects with enthusiasm and serenity. Apart from the release of new DVDs (Le dernier jour d'un condamné by David Alagna available since 20th October, Mediterraneo to appear) and forthcoming CDs — previously-unreleased opera recordings and a traditional songs' album —, his schedule in 2015 notably includes: Massenet's Werther in Bilbao in January, Le Cid and then Chausson's Le roi Arthus (first appearance) in Paris in March and May, Verdi's Il Trovatore in Orange in August, Meyerbeer's L'Africaine (first appearance) in Berlin in October, or also Donizetti's L'elisir d'amore in November. In 2016, among other characters, he will continue with Leoncavallo's Pagliacci and Puccini's Madama Butterfly and will tackle further new roles, such as Éléazar in La Juive by Halévy. His new album, “My life is an opera”, released on November 17, 2014 in France and in February 2015 abroad, has been well-received. 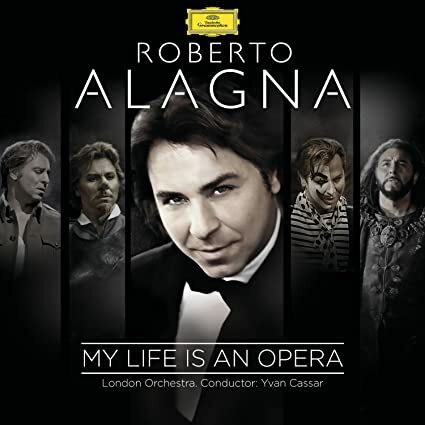 It contains 15 previously-unreleased arias and duets recorded in London and conducted by French conductor Yvan Cassar, illustrating his career and his life: Roberto Alagna, 100% opera! Questions by Opera Lively journalists Mary Auer and Luiz Gazzola. Editing and translation by Natalie Greenly. © Opera Lively, all rights reserved. New York, NY, USA, February 7, 2015. Luiz Gazzola for Opera Lively – Don José has been talked about over and over, but there are always interesting insights to be had, I bet. Please tell us how you see the psychology of this character, and what as an actor you try to imprint on the role. Roberto Alagna - Don José is a role that has been part of my life for many years, and that has grown with me, because I'm particularly interested in incorporating my own life experience into the characters I play. What’s certain is that the Don José I played twenty years ago is not the same as the one I sang last night. Over time, I have matured, with all the experiences and tragedies of one’s life. What’s more, at my age, as a result of my life experience, I never judge people's behavior. I always think that there is a reason why someone behaves in a certain way. Similarly, I always tend to see the positive side of the characters I play, whoever they are. What is interesting about Don José is that this opera is not about Carmen but about him. He actually is the main character; he is the one who evolves throughout the opera. Originally José comes from a religious background, where honor counts for a lot; and he is Basque. You have to understand that he got into his predicament because he killed someone. It is clear from this that he has a rather proud and fiery temperament, and a sense of honor. Because of what he did, he was made an offer: either he went to prison, or he could enlist as a soldier in Seville. And if you put yourself into the mindset of the time, think that for a Basque, a man of the North, to be sent to Seville was like being sent as a convict to Siberia or a criminal in exile. It was a serious punishment, a banishment. This is also why, when Micaela says, "your mother has forgiven you," he is very touched, because he knows his action ruined everything. He broke his vow to his mother who had hoped for him to marry Micaela, to be a good son, to replace his dead father, and to be the man of the family. It is important to understand that. What I like about this character is that contrary to what is often made of him - a three-dimensional character but a somewhat gullible one - in reality this is not the case. When we read Mérimée’s novel, we understand that he is instead a kind of time bomb that could explode at any moment. And fundamentally he is a very dangerous man, both because of his beliefs and his temperament. Don’t forget he is also a Spanish macho. So it is very difficult for him to say "I love you" to Carmen- he has never said "I love you" to his mother or his father, or indeed to anyone. In the fourth act when he meets Carmen again, he says, "let me save you and save myself with you." Personally I find here a link with Athanaël from Thaïs. He sees in Carmen a kind of incarnation of evil, as if she was bewitched by the devil; it is as if he wanted to exorcise her. He comes to her saying "Come, I come to save you, and I want to save myself with you." He behaves like an exorcist or a redeeming prophet who tries to save a soul, and save himself at the same time. And at the end, he puts it very well: "For the last time, demon, will you follow me?“. This aspect of the character interests me. When I was younger I saw in him a rather macho male side, hot-blooded, a little naive. Today, I see a much deeper character. OL – Even for a role you know as well as Don José, do you seek inspiration from illustrious predecessors? If yes, who are the ones you uphold, and what is your recipe for a great Don José? RA - Yes of course. As well as being a singer, I am a great fan of opera, theater, literature, etc., but my first passion is opera. I used to be a big audio collector. Nowadays with YouTube, you have at your disposal a huge library, a huge disco, a huge video library. It is an indispensable tool for me today, as I am still doing research. So I listened to all the historical Josés . When I was younger, I liked the Don José of Franco Corelli, Del Monaco, Vickers; Today I prefer something much simpler, that is to say, for example, those of Raoul Jobin, José Luccioni or even Alain Vanzo, because there is in them a greater simplicity in the way of saying the words and in the rhythm. I mean, there is no strong effect, and that is what today I seek in my singing. Not just as Don José, but in everything I do, and you will notice that in the last album I recorded, I am seeking simplicity. And I believe that simplicity is the hardest thing to find. OL – Your Carmen is the lovely Elīna Garanča. She is gifted in voice, acting, and looks. Please tell us about working with her. RA - It is a great pleasure to work with a partner like Elīna because we're friends, and we have a great admiration for one another. I must say that I am very lucky because I've always had a very good relationship with my colleagues, both men and women. Today, singing with someone like Elīna is really pleasurable because she is also a musician and someone who loves to share and have good discussions. For example, we have created this Carmen together. Of course, this is Richard Eyre’s production, but let's say that 60% is also our creation. I have great respect for my colleagues because I think that this profession is one of the most difficult of all. This is the only art-form today that makes us work in the same conditions as two centuries ago. We do not have the benefits of modern technology. For the audience there are recordings and so on, but when we we're on stage, we sing in the same way as we always have. Except that in addition, we have stress and pressures that singers did not in the past. Orchestral instruments have benefited from modern technology and are much more efficient, but our poor vocal cords are still the same. That is why I have great respect for artists who share the stage with me, and my partners know this. When I sing a duet, I like it to be a true duet, not a duel. OL - We were impressed with your recent and triumphant performance in Otello in the Chorégies in Orange. What especial challenges exist for the singer in performing in an open air theater? Wind, allergens in the air, temperature, acoustics…? On the other hand it must be pretty special to sing in this place steeped in history, including opera history (for example with the iconic Norma by Montserrat Caballé). Comments? RA - Orange is a special place, very challenging, but absolutely magical when there is no wind. But if the Mistral blows or when the weather conditions are poor, it can become a real nightmare. To start with the stage is huge, over a hundred meters, so with every entrance and exit, it's like a marathon. For example, for Otello this year, we had foul weather conditions. It rained almost every day and we were forced to postpone the performance, so that we sang Otello for four out of six days. What you saw was the final performance. I was sick, because as it was very cold and I was only half-clothed, I caught a cold. In addition, I dislocated two vertebrae. You’d have to be superhuman to sing in such conditions. At the same time, I must say that I am very proud, because I’ve been singing at the Chorégies in Orange since 1993 and it is somewhere that acts as a kind of barometer of my current form. Orange always takes place late in the season, so you've already sung a lot and you have to give your all in this massive theater, where you’re fighting against the elements. But these two thousand-years-old stones have a lot of soul, and returning there is a kind of a pilgrimage or ritual for me. You were talking about Norma with Caballé and Vickers, which is wonderful. Did you know that when they made this video, everything was from a backing track? They were not actually singing live. RA – Yes really! Because there was so much wind! RA - Pierre Jourdan directed the film. Everything was pre-recorded. Neither Vickers nor Caballé are singing live in this performance. OL - That’s disappointing, because for me this "Casta Diva" is the best live version, but if it’s a studio version, that's easier! RA - [laughs] Yes. It is a studio version! [laughs] But the images are beautiful, because there is wind, it floats and it is superb. This is why I say that what we’ve been doing there for years, singing live, is a major challenge. OL – Yes, right. It has been confirmed that you will sing Lohengrin at the 2018 Bayreuth Festival, with Christian Thielemann conducting (Anna Netrebko still unconfirmed but might be the Elsa). This is really a major step in your career – your first role in the German repertoire, isn’t it? RA - I’ve sung arias in German, but never an entire opera. Personally, I've always loved Wagner particularly interpreted by lyric clear-voiced tenors such as Georges Thill or Francois Gautier. The goal of an artist should not be to stay in your comfort zone, but to always push the limits as far as possible. I think I have an artistic soul in that I am always curious to surpass myself and to find new resources in myself so that I can give the audience another reading, another vocal aspect, another side of a work and my art. OL – How do you prepare for new roles? RA – I used to work with a great French vocal coach, Simone Féjard. Today I study new roles by myself. OL - Are you considering taking on other roles in the German lirico-spinto repertoire – Max in Der Freischütz, Beethoven’s Florestan, or the Prince in Humperdinck’s Königskinder, for example? RA - I have been offered Tannhäuser in a French version, and I’ve started to work on it, it's really a bel-canto work. And when you listen to Parsifal, so is that! In fact, there is Italianità in all Wagner’s works. [Laughs] It's everywhere. I was offered Florestan a year or two ago. I almost said yes, but the problem is that we were to do three shows in a row, every day. And I said no, because I cannot sing three days in a row. I felt that it was not professional, so I refused. I’ve always liked Florestan. The first aria is beautiful, and the ending is particularly superb. Ten years ago I was offered Max, in a French version by Berlioz; this was also interesting. To tell the truth, all these works interest me, but I still have to tackle so many works that are closer to my vocal type, so it would be ridiculous for example to sing Freischütz and Fidelio, but not to sing Fedora, or La Forza del Destino, Luisa Miller and Manon Lescaut. For time being I’m trying to do everything possible to prioritize singing these works. I’d also like to sing La Fanciulla del West, Il Tabarro, Samson, Jean in Hérodiade. So you see that there are many roles that I have not yet tackled, and it would be silly to perform others which don’t fit so well with my temperament and voice type, while ignoring roles that I consider almost my vocal birthright. OL – OK. This past December also saw the release of the DVD of your brother David’s opera, The Last Day of a Condemned Man, based on Victor Hugo’s novel opposing capital punishment. You not only sing the title role, but also worked with David and your brother Frédérico on the libretto. You’ve described the condemned prisoner as one of the most difficult parts you’ve ever sung. What do you consider the greatest challenges of this role? RA. This opera is extraordinary. I'm not saying that because he was composed by my brother, but because it's true. Whenever we performed it, in the face of any audience prejudices and preconceptions, it invariably ended with a standing ovation. The other day Michel Plasson mentioned to me how much he would like to conduct Le Dernier Jour d’un Condamné again. I think he also fell in love with this work, as did all those who worked on that score, be they singers, director, conductor, everyone. Forgive me if this sound pompous, but it is a masterpiece, in the same vein as Mascagni’s Cavalleria. Mascagni composed that as a young man for a competition, and my brother has a similar story. He wrote it because I asked him to. He was very young, only eighteen when he began. This is his first opera, and it is incredibly mature for a first composition. It is as if he was touched by a divine inspiration, a special grace. This opera is really successful, and I would even say it is a very strong work. I am very interested in contemporary opera, I listen a lot. I really think it is the modern opera which will remain in the repertoire in the future. I'm sure of it. You know why? Because most operas that are now being composed are written by great composers, great technicians, great orchestral masters, great connoisseurs of classical music, but not by opera lovers. And that's the big difference. In contrast my brother David is a true opera enthusiast, who grew up by my sides and has always been steeped in opera. Opera is in his blood. You can find in his writing a tribute to Mussorgsky, elements reminiscent of and inspired by Boris; it’s a very rich work. The creation of this opera is a kind of miracle. When I heard the colors in the orchestra, the power of this work, I thought, "this is a miracle." And now when I look at the DVD, I see the strength of this opera, I think it's really an extraordinary creation. The challenge in the opera lies in the fact that the main character is on stage from beginning to end. His vocal lines are extremely complex, with an uncomfortable tessitura, musically very difficult in terms of intonation, intervals, rhythm - very complicated, and at the same time the work is very demanding in terms of acting. It calls for a 100% investment in the role; you can’t step out of character at any point. Never. It's like La Voix Humaine - the woman who has to talk on the phone for an hour without stopping. But it has an orchestral and vocal power that makes it really deserving to be put on worldwide. I would love today’s tenors to have the courage to sing this work at some point. That would be fantastic. OL – Yes. I saw the Hungarian production on YouTube. The tenor has a similar voice to yours, so it worked well. RA - He has higher tessitura, and sings a slightly lighter repertoire than me. But he was once a theatrical actor, and he brought a beautiful interpretation and a beautiful musicality to the character. I congratulated him when he came to listen to me in Otello, I thought he really did a great job. OL – Absolutely. I’ve watched the piece and it is powerful, and cleverly staged with the two time periods presented on each side of the stage. The orchestration is dense and rich, and it is tonal all the way. Your brother is to be congratulated for a beautiful score. Is going back to tonal music a way to go for contemporary opera, after many of the atonal, dissonant works being praised by critics but failing with the public? RA - There is also dissonance in my brother's work. That's what is remarkable, because the condemned man‘s torment cannot exist without these dissonances. But they are planned. They contribute to the whole, they harmonize with him. This is not dissonance for its own sake, you see? David’s dissonances are justified, you hardly hear them, they don’t jump out at you, because they are completely integrated into the work. That is what he managed to do. For example, the ending is sublime: he wrote a kind of Sicilian tarantella, a whirlwind, a kind of dance that could be likened to a trance. It is a work that will catch on. We were asked for the score to perform it again in Poland. What other contemporary work has already had so much exposure in less than five years? A CD conducted by Plasson, three awards in Hungary, a live TV broadcast by Mezzo in seventy countries, two concert performances in Paris, a third in Valencia, the French stage production in Avignon, a DVD, TV broadcast on France Télévision, it's unbelievable. OL – Yes, it’s great. Are there any plans to put it on in the US? RA - We are working on it. In the US you can only create works in English. But since the condemned woman is a Black American, why not sing her part in English? I really think it might be interesting to have the part of the contemporary character in English, and that of Hugo’s original character in French. OL – That’s a very nice idea. RA - In fact we have already begun. At the beginning of the opera, the condemned woman is interviewed. When we put on the opera in France, this introductory interview was in English. We thought that every time we’d do it in a different country with a different condemned woman, we would do this interview in the language of the country - Korean in Korea, Spanish in Latin America, Russian in Russia and so on, before continuing in French. But for the US, the whole of the soprano part could be in English. OL - Great. Maybe we should do an interview with your brother, too, to talk about the creative process. RA - Yes, yes. He is preparing another opera. The problem today is that creating anything requires a lot of money. Without any help, without subsidies, it’s not easy to produce something on your own. OL - So no subsidy for works of such quality? RA - No, because you know you have to be in the inner circle. Because we work as a family we have always been marginalized, and I am constantly criticized, almost ostracized for it, without any foundation for this. It seems strange to me. OL - Is it because of your Sicilian origins? RA - No, not only that. You know, I never asked for anything. As a child, I was painfully shy. And even today, despite the fact that I have succeeded in this profession, I can’t approach a theater director and ask him "Can you put on this opera for me?" I've never done that in my life, nor has my agent. I know that many others behave like that, but not me. All the projects I have done in theaters around the world were suggestions that I agreed to . And when I had projects dear to my heart, works such as Cyrano de Bergerac, Orphée et Eurydice, and so on, instead of asking others, I produced them myself. This crippling shyness is a kind of fault which has caused problems for me; and it is rather odd because often the media and even professionals interpret it as ego, pride. But it's not that, it's in my family, we’ve never been bold. Our upbringing was never to ask for anything. You had to do things by yourself. My grandfather told me "if someone does something beneficial for you, you have to return it threefold." It's the Sicilian mentality, the Sicilian temperament. OL - With regard to your cultural identity: do you consider yourself Sicilian or French? OL - That reminds me of your YouTube clip, La Luna Mezzo Mari. It's such fun! I love it. RA - Do you know that when we made this video we were all actually in different countries? I recorded it without sound, just with clicks through my headset, and the beat. I sang over that, improvising all the staging. And then we put it all together. OL – Amazing! Let’s go on. In addition to your brother’s work, there was another contemporary opera written especially for you: Vladimir Cosma's Marius et Fanny, after Marcel Pagnol. Would you please tell our readers about this opera? We at Opera Lovely try to do our best to promote contemporary opera, which we feel is important to keep the art form alive. RA - I loved Marius et Fanny. I think it is a wonderful opera, which has been criticized by some as a being light opera, popular, simple. But it’s not at all simple, it's in exactly the same vein as Puccini. It's very dramatic, with a large orchestra. It's very difficult to sing, and I personally adored it, because to start with I already loved the character in the Marcel Pagnol trilogy, and then because I loved the music; I think it is very touching, and Vladimir Cosma was very successful in depicting the everyday lives of the people of Marseille. You can perceive the port, the city of Marseille in his work, and the protagonists are very well characterized. The music is very beautiful; it was a great pleasure for me to sing this opera. I hope I will be able to sing it again. Vladimir Cosma has since then become a friend. We often talk on the phone. I'm lucky to have these two beautiful contemporary works in my repertoire, and on top of that two operas are currently being written for me. I hope I have the opportunity to sing them too, because they are on topics extremely close to my heart. OL - In recent years, you have helped to bring attention to neglected works in the French repertoire, such as Massenet’s Le Jongleur de Notre-Dame or Édouard Lalo’s Fiesque. What other French operas do you think deserve to be performed more frequently? Are there particular composers whose music you believe has been undervalued and merit closer attention? RA - I’ve always liked to do justice to forgotten works or unappreciated composers. Because as I told you at the beginning of our conversation, I am passionate about opera and music. Already in my first album, I wanted to record little known arias, for example from Gounod’s Polyeucte. I had the chance to create Fiesque by Lalo. A pretty amazing story, because this work has never been produced, and there was no orchestration. We were forced to research the orchestration as Lalo would have wanted it. It is a true creation. It’s a beautiful work, and it’s a pity it has never been put on. Le Jongleur de Notre-Dame is for me Massenet’s most beautiful and surprising work. Each bar contains something novel. That famous simplicity I was talking about earlier, that is so hard to find, Massenet put it in that in very work. At the same time, that’s what makes it so complex. The plot, the harmony, everything contributes to making it a masterpiece. But there are other things. I remember for example, that when I first started out, I was the only one singing Roberto Devereux. Similarly when I sang Lucia di Lammermoor in French, it was a work that had not been put since its debut. Or, I was the first to sing the second version of “Una furtiva lagrima” by Donizetti, which was written ten years later. I’ve recorded the longest version in existence of Contes d’Hoffmann, with some parts being sung and recorded for the first time. And now I’m always engaged in research at home. These days, for example, I would love to put on a work like Anton Rubinstein’s Nero; a fantastic work that has never been produced. Or Franco Faccio’s Amleto. He was Verdi’s orchestra conductor. And then they fell out because Verdi went off with his wife. RA - Yes. But he was a good composer; he created a Hamlet in Italian for a tenor to sing. It's a bit like when we rediscovered Alfano's Cyrano de Bergerac. I came across the score by chance. And when I saw it, I had tears in my eyes, because I found it so incredibly beautiful, and I kept it with me for five years. Five years passed and nobody wanted to produce it. So I put it on myself. And you know that we are the only ones in the world to have sung the 1935 French version I created together with my brothers. Alfano had to change it in 1936 to an Italian version for José Luccioni in Rome. Then, when the work was given in France, it was translated back from the Italian version, while the original 1935 version was never produced. Today I’m delighted because Ricordi have published a new score in the "Alagna" version [laughs]. OL - Fantastic, you are making your mark in the history of opera, aren’t you? RA - We researched all the Ricordi manuscripts and original documents, and my brothers and I worked using these as a basis. OL – At the age of seventeen, singing in Parisian cabarets, you met the Cuban bassist and singer Rafaël Ruiz. Ruiz was to become your first singing teacher. Did he also transmit to you some special love for Latin Jazz, for example? If yes, who do you like to listen to, in this genre? RA - Yes, of course. You know, I spent some of the most beautiful moments of my life with Rafael Ruiz, because he was a great man from another era. Let’s not forget that he studied with Aureliano Pertile, Toscanini’s great tenor at La Scala, who was teaching at the time. Then he became a bassist, lived in several countries, and ended up in Paris as a bassist in the cabarets of that time. He was Cuban, and at his house I met some amazing people, such as Ray Barretto, Yuri Buenaventura, people who visited him bringing with them new rhythms. I was bathed in this music, rumba, since my childhood, because I was just fifteen when I started with him. He introduced me to the operatic aspect of my voice. I knew opera through my family, and it seemed something untouchable and sacred. When I started in cabaret, it was he who told me that I was a tenor, and with him that I found my voice. But at the time we were singing Cuban music, rancheras and so on, every night. I sang this repertoire for years, and I have to say that was also useful for opera, for developing musicality, but also for stamina, and for swing. Swing is very important. And if you listen to my crossover albums, you can hear it. Rafael Ruiz was a key element in my development and my artistic construction. OL – Your new album, “My Life is an Opera,” was just released in France a few months ago. Can you give those of us on this side of the Atlantic a bit of a preview before it’s released here, and tell us about the arias and duets you recorded on this disc? RA - It's been about ten years since I last recorded an opera studio album. By that I mean that all my operatic recordings of the last ten years have been videos of live performances or concerts. Over the last ten years I have only done crossover in studio. So this opera disc is a real return to studio recording, and it has not been easy. I had already recorded many recital discs and I already have a satisfactory discography. So I wondered what to do next. I told myself that nowadays I am sharing a new life, a new beginning, with Aleksandra [Kurzak]. It is as if one chapter has ended and a new one has begun. And so I felt the urge to chronicle the progress of my career through arias in the recital. It's as if I have done a retrospective of my life as an opera. There have been happy moments, drama, tragedy, comedy, there has been love, fairy tales, fables, success, failure, betrayal, all this in my life so far. All these elements make it a real opera. So I said to myself that if I do an album, it will include opera arias that illustrate the stages of my life. But then again it’s not that simple. I thought that the album purchasers might ask "why is he singing this again?" We had to find a way to tell what I had done and lived through without repeating ourselves, but rather with arias that were new to the public. That’s why when I sing Le Dernier Jour d’un Condamné I chose the Condemned woman’s aria, because I had never sung it, it’s quite new. Originally, these words were written for the condemned man, and we had adapted them for the condemned woman. So now it's a bit like returning to Hugo’s original text. As for Orfeo, I had already sung it in French, so now I chose to record it in Italian. It is a tribute to Pavarotti, and at the same time I can show that I too was Orpheus when I lost my first wife. I too have experienced the feeling that the ground has crumbled away under my feet; I too wanted to go in pursuit of her in the afterlife because I thought it was so unfair to die at twenty-nine, when she had just given birth to our child. Here’s another example: the recital opens with the aria "Manon mi tradisce" from Manon Lescaut. Actually, while I was preparing this role, I fell seriously ill, and never got to sing it. It is as if she had really betrayed me! Thus this album recounts key moments of my life and my career. Always with allusions, with images ... but you have to read between the lines! RA - And also there is also a funny allusion. In the album I sing a duet with my partner Aleksandra, and we chose Roberto Devereux. Why this particular work? Because on one hand for Aleksandra, it predicts the path her voice will soon be taking; and for me on the other, it's as though, thanks to this young woman who has made me a father again, I have been rejuvenated. That's why I'm singing a role with the same first name as me, a role that I sang as a young man, to show that I have a new lease of life. Do you see? So everything is more or less founded on this kind of rather charming imagery. OL - You are now the daddy of little Malèna. She is adorable. Congratulations. OL - At at this point in your extremely busy international career, is it difficult to manage your daddy duties versus your singer duties, especially since your wife is also a singer? Is it viable for example to plan on having performances where you and Aleksandra are both singing so that the whole family can be together? RA - Yes, it is very difficult, because I found it very hard when I was travelling and had to leave my first daughter Ornella with my parents. Even if I wanted to take her everywhere with me, her schooling made it impossible. I was always very sad, and I couldn’t enjoy the beauty around me because my thoughts were always focused on my daughter. Today she is twenty-three, she is beautiful, she is wonderful. So when she began to branch out, to have her own home, her friends, her own life, I began to open my eyes and suddenly I loved New York, I liked to travel, because my spirit was free. When Aleksandra and I planned to have a child, initially I was a little scared, because I was afraid to relive that. But today I am delighted, because it is a new youth, a new strength; it's beautiful to live though these moments. I would simply like to enjoy a little more of my family. RA - Yes, yes. That's right; it's not always easy to sing some evenings. It is a difficult job. But you know? I would say one thing ... Somehow, that it’s good they don’t understand that. Because I think that if the public or the critics knew the difficulty, knew the problems, the conditions we sing under, they would suffer as much as us, and that would be the end of this business. That's what an artist has to sacrifice. RA - Last night I sang Carmen here, and I think that it was one of my best performances ever. It was my hundredth performance at the Met. I have never had such a reaction, from the director, the public, my partners, my friends. Everyone at the Met came to congratulate me and say "You sang amazingly, your voice was so fresh! “ It was one of those nights where everything goes well, everything sounds good, the high notes are great, it’s a success. You always perform at a certain level of course, but yesterday was one of those magical evenings. Because you know, as Caruso said, you are on top form twice a year, and usually you aren’t singing on either evening. [Laughs]. God gave me the strength to sing Carmen perhaps as I never sung it in my life, and I was very happy, everyone was delighted. OL – I hope you'll be in the same shape on Monday when I come to hear you [laughs]. You must be the busiest singer in the world. Just in the 2012/2013 for example, you gave some forty performances and recitals, tackling 14 different works including 4 role-creations. How do you manage to do it? Is it important to get very organized? What about the voice? Do you have to put yourself through various constraints such as speaking little or avoiding sources of possible respiratory illness, to be able to keep going in this incredibly busy schedule? OL -It is a bit of a surprise to me, because I find you very interesting. RA - Maybe, but I never found myself interesting, and I am surprised that people can be interested in me or my stories. It’s strange. For a long time I felt invisible. I was invisible, nobody noticed me. I really existed through the characters I played on stage, because there, my shyness disappears, and I become someone else. I think it is a shy child complex. OL - That brings us to my last question. What is the person Roberto Alagna like, in terms of personality, take on life, hobbies, and favorite interests besides opera, classical music, and family / friends? RA - I like human relationships. Human relationships are something that touch me enormously. I don’t need to talk much. For example, I have a childhood friend who is a gypsy, we've known each other since we were six, and we can spend days together without speaking, just being together. We don’t need to talk; there are signals, looks, things like that. I had the exact same kind of relationship with Luciano Pavarotti. We didn’t talk but we understood each other through looks, like Native Americans. [Laughs] My passions? Certainly reading - I have always read voraciously. I am a very wide reader who enjoys all sorts of subjects if I am interested in them. I can easily range from comedy to literature, to religion and so on. I also have a passion for musical instruments, for film, for the arts in general, painting, sculpture. I'm lucky because I have brothers who are painters and sculptors. Aside from the arts, I have no interest in cars, casinos, gaming, nothing of that kind. What interests me is psychology, the human condition, human behavior. For example in politics, I’m an observer. It’s not really what politicians say that interests me, but how they say it, how they influence people’s behavior. I love history too. I am also interested in religion, in all religions even though I am a Catholic - and in theology. My great-grandmother was a great storyteller, when I was a child, she told me Bible stories, as though they were films. And that is perhaps what made me love opera. She had a talent. So you see, I’m pretty eclectic, but what I love most is people, I love my fellow humans - that’s what interests me. If you came to this page through a link from another site, please consider exploring our exclusive interviews (as of today, 167 singers, scholars, conductors, stage directors, composers etc. including some of the most prestigious names in opera), news, and articles by clicking on the Articles tab above and using our new clickable content index [here], or the Section Widget on the top left of the Home page; our very active discussion Forum (of course, by clicking on the Forum tab - and please notice that over there we also have an area with content in Spanish, German, French, Italian, and Portuguese). You might consider the purchase of ours books "Opera Lively - The Interviews" volumes 1 and 2 - full announcement and links to sales points [here] for volume 1 and [here] for volume 2, just released. Also don't miss the very funny book by famed Met tenor Jay Hunter Morris, "Diary of a Redneck Opera Zinger" published by Opera Lively Press; click [here]. Also on sale, our guidebook to Berlioz's Les Troyens: click [here], and the very recently published guidebook to George Benjamin's Written on Skin: click [here]. Bookmark our site and come back for more - several new and exciting interviews are always coming to Opera Lively. We are transcribing and editing our exclusive interviews with Ailyn Pérez, Nadja Michael, and Peter Mattei. Aleksandra Kurzak and composer David Alagna will be coming soon, as well as Stephen Costello, Heidi Stober, and Layla Claire. For those who have visited this page when it was only a place holder and a link to the French version of this interview, now as you can see the full interview has been translated into English, and photos and video-clips have been added. Enjoy!